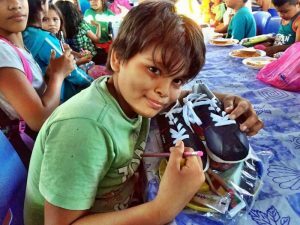 In 2009, our ministry was given 2000 pairs of new shoes “free” to take to the nations we work in. We were blessed to be able to wash the feet of that many children, youth and adults and bless them with new shoes & socks . However in order for us to continue this ministry of showing the love of Jesus through giving a new pair of shoes, we need to purchase the shoes to give away. A small gift of $5.00 will buy a new pair of shoes for a needy child to bless in other countries.